Dogs, especially puppies, can be easily distracted when you are trying to train them. A new patent-pending dog product was created recently to help dog owners battle this common problem. 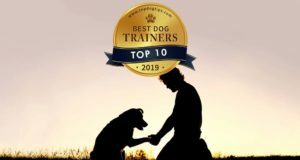 Janice Paré, inventor of The Obedient Pup Neck Gaiter Training Aid, created her product to keep dogs from becoming distracted and to help restore a dog back to a calm state after they’ve been distracted. Paré says that she has had many dogs of her own and seen many other dogs get distracted while walking on a leash and that’s what gave her the idea to invent The Obedient Pup. She says that many owners try to cover their pets eyes, push their head away, or simple continue pulling on the leash in the direction the dog should be facing. All of these methods are a hassle for the dog owner and yanking on a leash can be physically harmful to the dog as well. When Paré began finding it hard to control her 95 pound pooch while taking him for walks around her neighborhood, she began to get frustrated. She says that he would notice a squirrel or other small animal and pull on his leash, literally dragging her down the sidewalk. She never looked forward to walking him, although she knew it should have been an enjoyable experience. Paré believed in the theory “out of sight, out of mind,” so she began designed a neck gaiter that she could use to pull around her dogs face to use as a blinder. She believed that if he didn’t see the distractions he wouldn’t run after them and their walks would be much more pleasant. After several weeks of testing she had created The Obedient Pup Training Aid. What makes the product so unique is that it is used as an accessory on the dog to begin with. It simply looks like a stylish neck gaiter, but then it can be quickly turned into a pull over dog blinder which prevents a visual distraction from stimulating the dog. Once the distraction is gone The Obedient Pup can be pulled back around the neck. It is made of a soft stretchy polyester and lycra fabric, so it is comfortable and your dog won’t even realize he’s wearing a training aid. 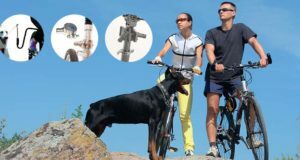 It is currently the only device of its kind on the pet product market. Since Janice found it worked so well on her dog and saw other dog owners with similar situations she decided to make it available to all dog owners. She is looking for pet stores interested in carrying her product and is also willing to license the product to interested companies.